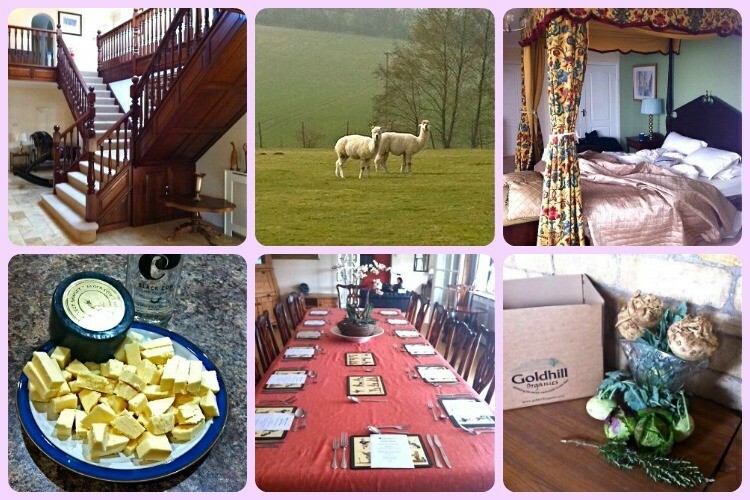 Last month a group of food bloggers gathered for a weekend of Dorset food and fun. If you follow me on Twitter, FB or Instagram, you may already have seen several posts tagged #HCBloggerTrip. The large country house almost looked as though it could have been built in the 1930s; it reminded me of an Agatha Christie style venue where the guests are bumped off one after the other. Luckily no bodies were found floating in the pool and the only victim was a vast quantity of Dorset provender. We were hosted by the gracious and industrious Emma and Sarah from holidaycottages.co.uk and you can read Emma’s account of the weekend here. Our residence for the weekend was Ranmoor and a couple of smaller holiday cottages which are situated in the beautiful rolling Dorset countryside not far from Blandford Forum. Several of the bloggers were already ensconced by the time I arrived and I was greeted with cries of “wait until you see your room!” It took a while to get to my room as Emma wanted to show me around and the house was huge. When I eventually got there, I couldn’t have been more delighted; my room was large and had a four poster bed as well as a walk in wardrobe, a sofa and an en suite shower room with views of next door’s alpacas and the woods beyond. The kitchen was well appointed and had a friendly central block with stools so we could all sit around and chat whilst watching Emma and Sarah do all the hard work. It also had a pool table and a sun room. The dining room was large and easily accommodated the fourteen of us, as did the split level sitting room with its two seating areas. It has eight bedrooms so can easily sleep 16 people with additional cots and pull out beds for children. Ranmoor, I decided would be a great place to holiday with a group of friends, to celebrate a family occasion, or dare I say it, partake in a murder mystery event. Well the weekend was really about showcasing the wonderful Dorset food and drink on offer and we certainly got to sample a lot of it. The fridges were stuffed with award winning and highly quaffable Dorset Nectar cider, beer from Cerne Abbas Brewery, still and sparkling wines from Furleigh Estate and soft drinks from the Dorset Ginger Company. There was plenty to keep us going for our do-it-yourself breakfasts too, including Dorset Cereal, a flavour packed local honey, Dorset Tea and hand roasted Reads Coffee which, I’ve been reliably informed, was excellent. On arrival I had a cup of the most deliciously fragrant Earl Grey tea from The Guilded Teapot. It wasnt long before we got stuck in to the milk vodka and cheese from Black Cow. Yes, I did say milk vodka as in moo vodka. The vodka is made from the whey produced by the cheese making process and is triple distilled, giving it a very smooth taste. I was a little dubious about drinking neat vodka, but I followed instructions and sipped whilst nibbling the cheese and found it was a lot more to my liking than I’d anticipated. The cheddar like cheese was a really good one and I wolfed down rather more of it than I probably should have done. The pure all butter shortbread cookies imprinted with the Cerne Abbas Giant caused much ribald hilarity throughout our stay. This didn’t stop us chomping our way through both the individual sized and giant versions. Made my Percy’s Bakery, I’m pretty sure these are a best seller – we’re into “have your seaside postcard and eat it” territory here. For those not in the know, the Cerne Abbas Giant is a chalk carving over 1,500 years old and 180 feet high. Each finger measures seven feet and the appendage to which we all alluded measures forty feet. Size matters, it seems. On our first night we had a fabulous three course meal cooked for us by Dorset Fine Dining. The vegetarians were well catered for, which was good news as there were five of us on the trip. We started with feta and mint pastilles and then went on to a very tasty Moroccan chickpea and aubergine tagine with giant couscous. I’m not generally keen on coffee deserts, but the chocolate eclair filled with mocha custard and covered in chocolate sauce was totally gorgeous and the gold leaf finish gave an added air of decadent luxury. The weather was kind to us, which meant we could take advantage of the large garden and outdoor facilities. The swimming pool was closed for the season, but some of us took advantage of the hot tub. I went for a wallow early on Sunday morning when everyone else was still asleep. I sat watching the sunrise and frost covered fields and felt thoroughly relaxed for the first time in ages. We all had a go on the trampoline which was cleverly sunk into the ground to minimise accidents. This certainly gave me the confidence to have several goes and I began to wish we had a garden large enough to put one in. Not only is it great fun, but it’s an excellent way to exercise without putting too much strain on your joints. I was also delighted to find badminton nets and I managed to bat around a shuttlecock with Chris from Thinly Spread and Kate from WitWitWoo even though I hadn’t played for over 25 years. One of the highlights for me was our visit to Goldhill Organic Farm who had provided us with all of the vegetables we ate during our stay. The farm is a small one, producing vegetables grown on a raised bed system to Soil Association organic standards. As this is how we grow our own vegetables, though on a much smaller scale, I was particularly interested in the tour by farmer Sara Cross. I was very impressed with the farm shop which was well stocked with all sorts of Dorset food and organic goodies and was well used by locals and visitors alike. Goldhill Organics run a box scheme which delivers the farm’s veg and other local produce to homes all over Dorset. With demand for good ethically grown food rising, watch out for their new juicing box soon to be delivered across the UK. The popular on site cafe, Tea and Sympathy, fed us with a delicious vegetarian chilli, flatbreads and salad for lunch followed by the best Dorset apple cake I’ve ever eaten – bar my own of course! A quick look around the art gallery completed the visit. It wasn’t long before we were eating again. When we arrived back at Ranmoor, a full-on Dorset afternoon tea was awaiting us in the dining room. Stylishly laid out with vintage crockery by BethellBridge Bakery, it would have been rude not to try, ahem, a morsel or two. Sandwiches consumed, it was time to move on to the scones, cream and jam and that’s when the peace was shattered. You wouldn’t believe, or perhaps you would, how animated folk can get when they’re trying to convince everyone that the only was to pronounce scone is ‘scoan’ as opposed to ‘scon’ and vice versa. When it came to jam versus cream first, there was downright uproar. I sat their smugly, of course, knowing that the true way to eat a cream tea is the Cornish way – jam first followed by a good dollop of clotted cream. The fuss didn’t die down until we got onto the cakes – need I say more. Tea was followed by some games and an afternoon tea themed quiz, where I didn’t do nearly as well as I thought I ought to. There is still much to learn it seems. I drowned my sorrows with plentiful cups of Earl Grey. More Dorset food and drink followed a bare couple of hours later, when we managed to consume some delicious pies from The Dorset Pie Company and a whole pile of mashed potatoes followed by some Purbeck Ice Cream. We had a box full of samples and as some of the flavours were somewhat unusual and the ice cream was delicious, we pretty much managed to polish them off. Goodness, Dorset has so much wonderful food and drink to offer, we were thoroughly stuffed by the end of the weekend, but it didn’t end there. We all had a large goody bag to take home. Mine included a watercolour print of Man O’ War Bay by Kevin Williamson, a bar of handmade Purbeck Soap, a Funky Pigeon apron and a beeswax candle from Gold and Black Candles as well as some more items of Dorset food and drink: aromatic Conker Gin, Thomas J Fudges delectable Florentines, olives from Olives Et Al and gorgeous hand painted chocolates from Chocolate Arthouse; these were all to be found along with some of the items we’d already tried that weekend. I was delighted to see a box of Honeybuns cakes and biscuits amongst the bounty. I’ve posted about this Dorset gluten free bakery before and also when I reviewed their fabulous baking book. I was impressed then with their unstinting use of good quality ingredients and I’m impressed now. Thanks go to Emma and Sarah for looking after us so well. To HolidayCottages.co.uk for the fabulous accommodation and photograph of the house, to Goldhill Organics for the farm tour, talks and lunch and to the many food producers and caterers that provided us with such an abundant quantity of delicious Dorset food and drink. I was not required to write a positive review and all opinions are, as always, my own. Lovely reminder of a great weekend away! I’ve been enjoying reading the other posts on the weekend too for the same reason. That looks fabulous, such a beautiful house and the food looks amazing. This was a nostalgic read for me , having spent the first 29 years of my life in Dorset. Back then the most famous local product was Moore’s Dorset biscuits and Dorset knobs. The factory was in Chideock, on the coast road, or near there. My cousin worked for Ungarwtti’s now Dorchester Chocolates or House of Dorchester. Their rose and violet creams were amazing! Ah, it’s a beautiful part of the world and a great place to grow up I’d imagine. I was rather worried we’d get some Dorset Knobs to try, but luckily we were spared those. Their biscuits are really good, but I was not impressed by the knobs which nearly knocked my teeth out when I tried them a few years ago. I like the name Ungaretti’s sounds a lot more interesting than House of Dorchester. It sounds fabulous! The cottage sounds great for family holidays too, or trips with friends. We were lucky Daphne, in all sorts of ways and had a great weekend. What an amazing weekend it sounds wonderful .I love all the foods as well and the place looks awesome. I was disappointed not to be able to come down for this – too far! It sounds lilve it was a fantastic, spoily weekend with delights in not only the scope of local food, but also splendid accomodation and company. Great post! Looks like you all had an incredible gourmet weekend! We really did Angie. I’d like to say I’m still recovering but I’ve been eating quite a bit subsequently! Thanks Sus. I’m so glad I went and thank you for getting me into that hot tub. It sounds like you all had a great time. What fun. I’ve never been to Dorset. A bit of an odd one for me to get too. Yes, good point Jac. I’ve no idea where the nearest airport is. It’s a lovely county VP and now I know there is more to it foodwise than Dorset knobs! Yes, it really was a lovely weekend and great to meet up with a few other food bloggers too. Wow, sounds like an awesome trip!! You sure packed it all in!